This RC has two simple fixes that are non-breaking and totally awesome. #347: Optimization that brings export time down by a third to a half. The file size remains the side and nothing is needed to activate it. Using the “Optimize” checkbox was not optimized this time around. #350, #351: Two animation bugs that would cause strange offsets when using bones. You may or may not have experienced this. Again, there is nothing to do to activate this, it is part of every export. If you run into problems, please file a bug. If you do not notice a decreased export time with large models, also please tell us. We’d love to benchmark this on more data. #264 caused some people’s lights to be put in the wrong place. The fix involved Ben coming up with awesome math to put things back in their place by a certain offset, and then us creating a way to parse the light.txt file that controls much of the lighting in X-Plane. This Changes Nothing in Your Blend files! Seriously! No Blender data should change! XPlane2Blender is now more consistently WYSIWYG! Meaning that if you point a spotlight at a wall, it should show up pointing in that direction, regardless of what a named spill light thinks or the parameters of a param light think. This is good news for new authors and authors suffering from the bug, but depending on how you’ve been making your lights appear rotated, it could result in needing to change the rotation or parentage of existing lights. In rare edge cases, special and less used lights will be excluded from auto correction. Please Send Reports Of How This Affects You – Good, Neutral, Or Bad! We try our best for backwards compatibility and a bug free existence, but we don’t know everyone and their situation until they say hi! If you are faced with large hurdles to continued productivity, please file a bug! Preferably with before and after pictures and .blend files. Automated fixes may be developed for people affected. 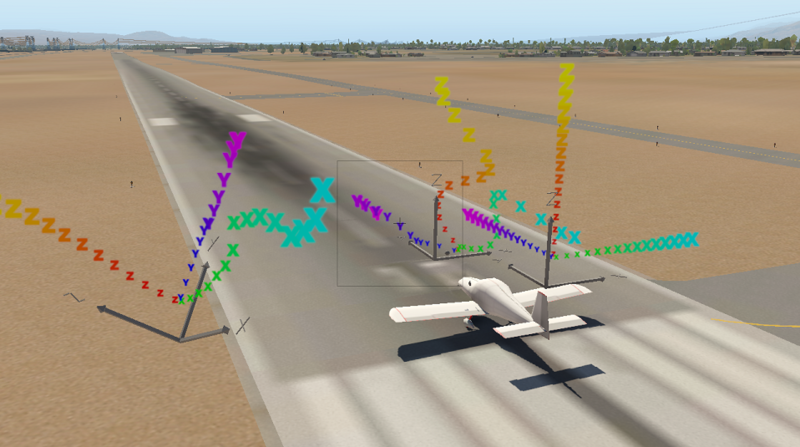 This is just one step to a more WYSIWYG XPlane2Blender. 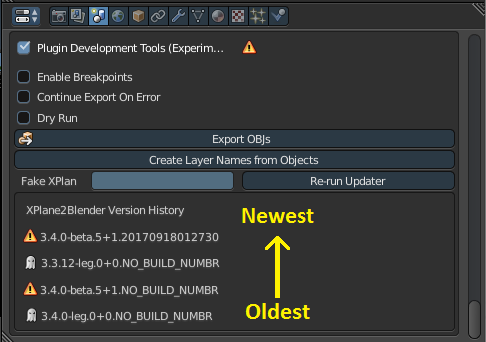 XPlane2Blender’s new version number system will allow us to debug .blend and .obj file even faster. It should also make making updates to the data model easier to implement. 5: the build type version we’re on. Since this is beta 5, the build type version is 5. 20170922151901: The “build number” date this source code was packaged and released in the form of YYYYMMDDHHMMSS in UTC. 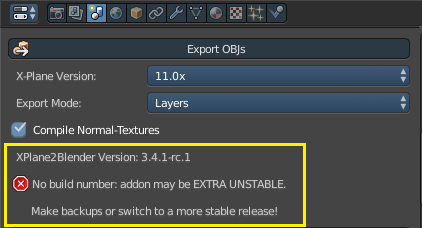 The build version number is partially shown (elements after the + are hidden) in the scene settings under Composite Normal-Textures, potentially along with warnings about the stability of the build you are using. Notice the green check mark and lack of any warnings. It is the worst case scenario for stability and traceability, hence the nuclear symbol. Why the extra warning about a lack of a build number? A lack of a build number indicates that you do not have a good dialog (e-mail, chat, this release page, or other channels) with a knowledgeable and attentive developer. This means your work is more likely to be run through a bad version of the code and damaged, or your bugs will be harder to diagnose and repair. In this case, despite the code appearing to come from a stable era of the code near a release, there is potential for something to be wrong and have very poor ways of tracing what it could be – hence the lack of green check mark and big red warning symbol. If you see some new pre-alpha feature you’d like to try, just ask us about it first. Going forward, we want to start with a dialog about potential dangers, testing, and intentions of an incomplete feature rather than an autopsy later on. Don’t be scared, we always love hearing from users before there is a problem, not after! 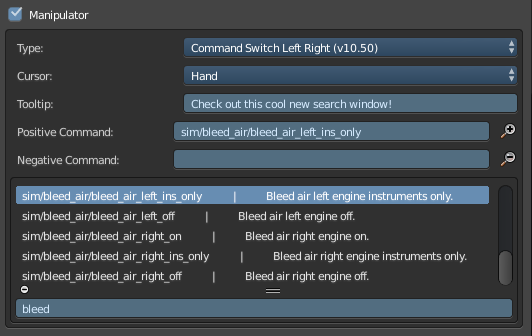 Also, all .blend files will be keeping a log of every different version of XPlane2Blender that they are opened and saved with. This is automatic and needs no involvement from the user. Those who are curious can look in the Plugin Development Tools section at the bottom of the scene settings and see the history of their file. Note: This does not record any history data about Blender versions, other addon versions used, timestamps opened or saved, or changes made to it (including XPlane2Blender settings changes). It is purely useful as a debugging tool, and is not fool proof. This .blend file started as a legacy 3.4.0 pre-beta.5 file, and was then with a copy of 3.4.0-beta.5, with no build number. Then it was used with 3.3.12, then finally, used with a build of 3.4.0-beta.5 created on 09/18/2017 at 01:27:30am. One could use this information to guess what transformations the data could possibly have gone through along each step of its journey. An uncaught spelling mistake __upgradeLocRot vs __updateLocRot. The fix for the updater altering the animation types was written for object’s dataref animations and bone’s dataref animation troubles. 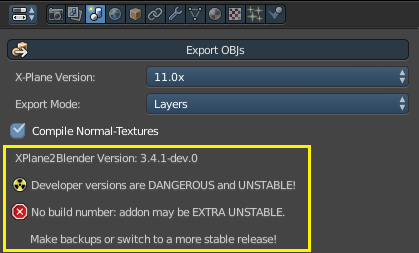 However, with this spelling mistake and Blender’s uncanny ability to eat exceptions from addons, it wasn’t realized until later that bone’s weren’t also getting updated. Fortunately, the updater can be run-again without fear of messing something else up. At the bottom of the Scene Settings, check “Plugin Development Tools”. Use the Re-run Updater tool at the bottom: Put in 3.3.9 in Fake Version, and click the button. 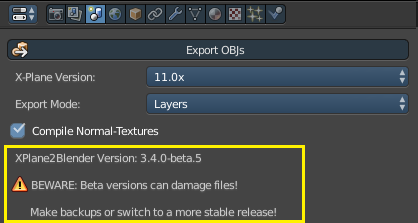 You should see your bone values corrected, as long as you successfully reverted any bad changes from v3.4.0-beta.1. Please e-mail me if you have problems! Some spelling and capitalization in the UI. Great care has been taken to ensure that none of the actual value or order of the addon properties has changed!